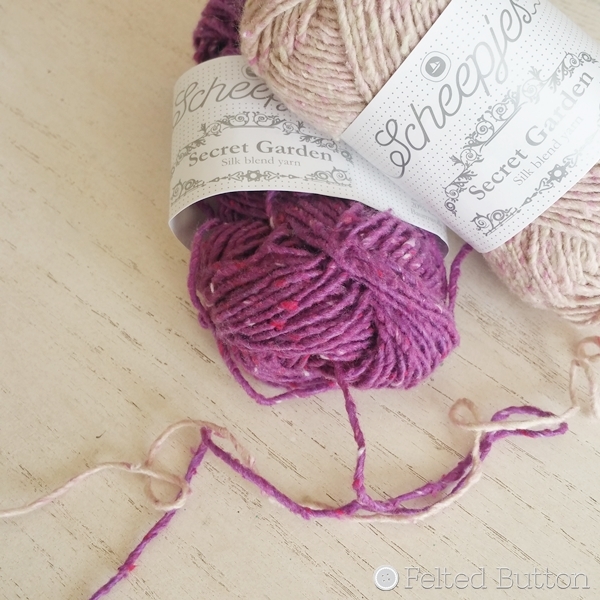 Last December I received some new yarn from Scheepjes called Secret Garden*. Wanna see some gorgeousness? 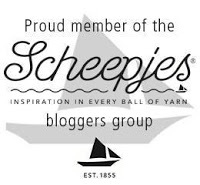 During Blogger Days, Scheepjes was kind enough to gift us with some beautiful gifts for Sinterklaas. 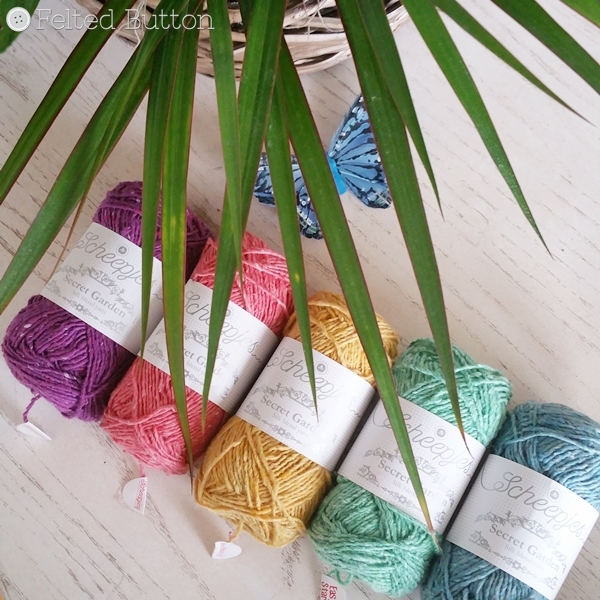 One of the amazing things I received was some of the new solid colors of Secret Garden yarn. I immediately fell in love with the colors and began dreaming up a project. But first I wanted to play a bit with my hook to see how it worked up. The recommended hook size is 4mm and that seems like a good fit for some lovely drape, but because of the "nubby" texture I think a larger hook would also be appropriate. I ended up settling with a 5mm hook--but I'm working lots of slip stitches so it's really warranted here. 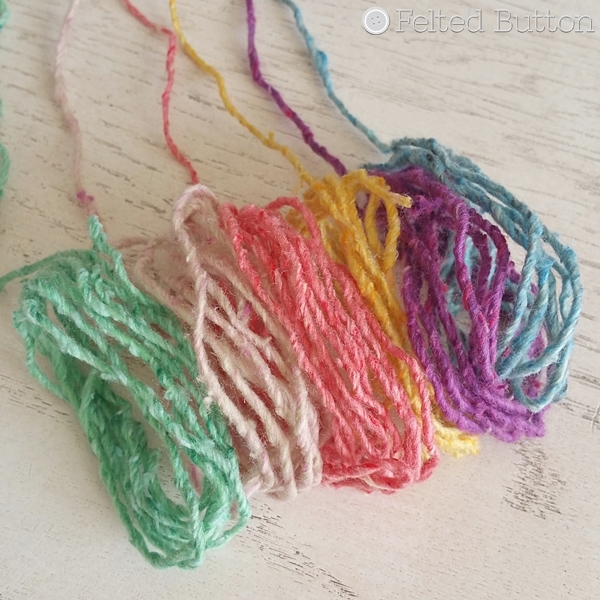 Throughout each ball, you find slight variations in thickness of the strand as you work. I don't find this bothersome as I think it adds interest and a beautiful handmade quality to the item. It feels very Anthropologie to me. 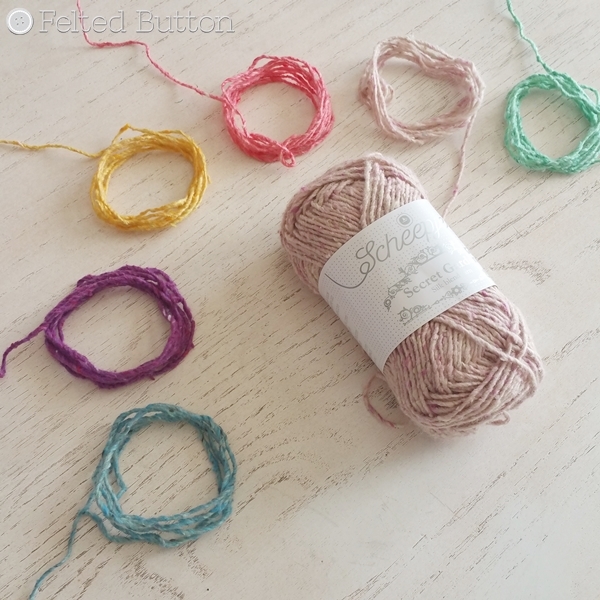 With a 60% polyester, 20% silk and 20% cotton blend it feels like no other yarn I've worked with. It has a super soft hand, nice loft without much halo, and variable colors through the fibers. It really feels like a luxury yarn. 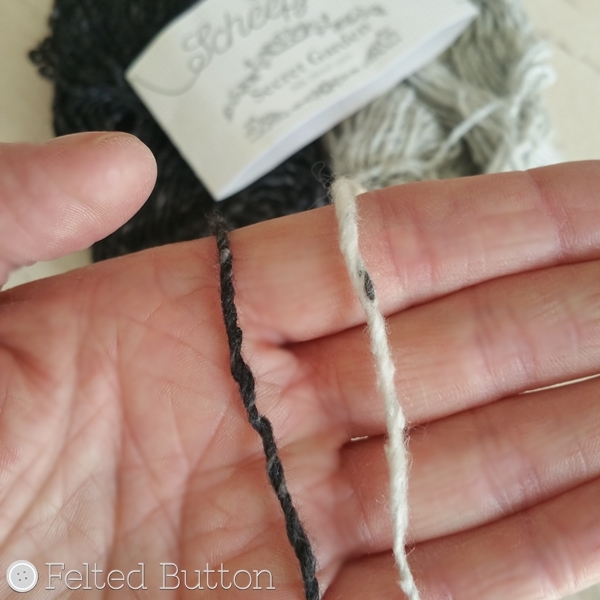 Not only are there slight variations in the thickness as you work the yarn, but there are also tiny flecks of additional color--not exactly a heathered look--but the flecks make for a more "imaginative" look. I like that because it allows two colors with similar flecks to really work well beside each other. The two balls above are a good example. The purple (Wisteria Arch) look lovely with the blush pink (Wishing Well) because of the little touch of purple in the pink. But the Wisteria Arch would look fabulous in partnership with the red (Whimsical Topiary) because of the red flecks within it. Pretty awesome! 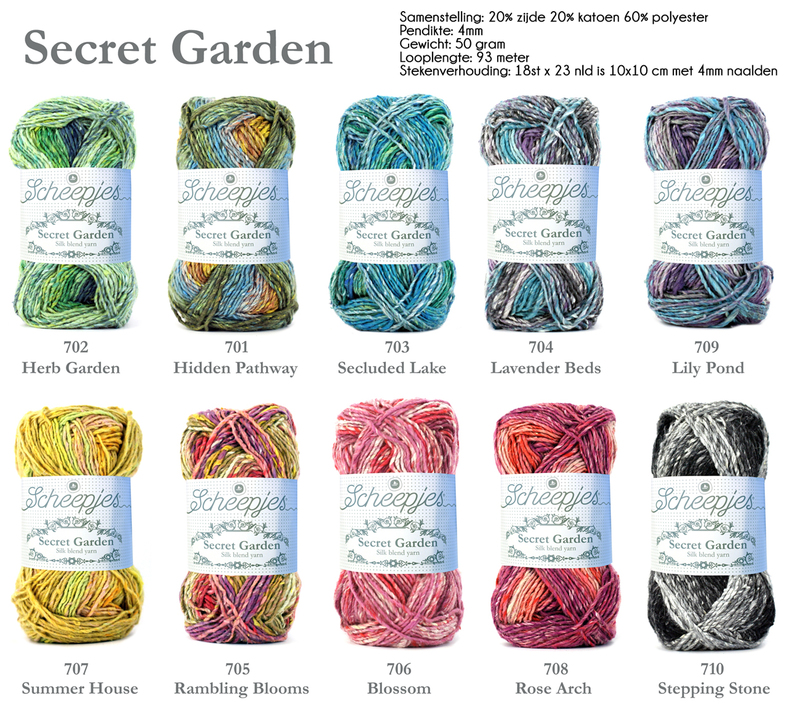 And if you really want to go to town, you can add in some of the variegated versions of Secret Garden. Beautiful, huh? My brain goes wild with ideas for the fun I could have with all of these colors! As you might have noticed, Secret Garden comes in 50g balls, with 93m (102yds) per ball. Typically for me, I've used bits of all of the colors I received for a relatively small project, but that has given me plenty left over to make something else. 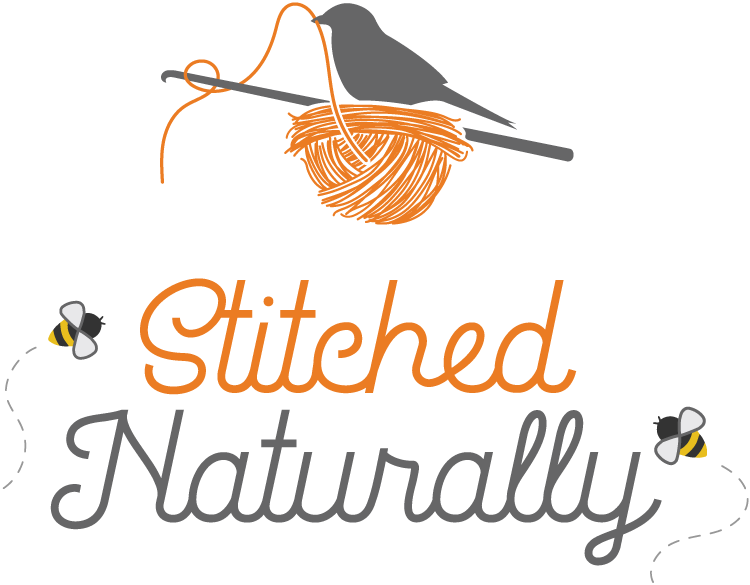 Stop by next week to get a little peek at what I've been working on and watch for the free pattern in the coming weeks. In the meantime, you might want to get some Secret Garden added to your stash in preparation. You can find it from the UK with international shipping at Deramore's here* or Wool Warehouse here*. If you're in Canada, you can find it from Knotty House here*. And, it is located in The Netherlands and surrounding areas in your local shops here. *This post contains affiliate links. If you choose to use the links it won't cost you any more, but I might receive a small amount that helps me to keep free patterns coming.